Organized by Oscar winning composer, Jan Kaczmarek, the Transatlantyk — Poznan International Film and Music Festival began in 2011, the year I moved to Poland. It seems only fitting that in our last summer here, that we join in the festivities of their fourth season. We participated in grand style last night. My friend, Barbara, was kind enough to invite us to join her group of friends for Transatlantyk Kino Kulinarne, which is done in partnership with Kulinarisches Kino (Culinary Cinema) from Berlin. We were part of about 200 people who saw Charlie Chaplin’s 1936 film Modern Times. I’ve never watched all of one of Chaplin’s films before and was surprised to see that besides starring, he wrote, directed, and composed the music for the theme song. 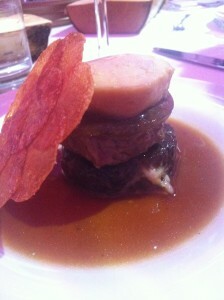 The first course was three mini-sausages, one each of pork, lamb, and boar; served on top of an onion marmalade. It came in a 35 mm film can, which we were invited to take home as a souvenir of the evening. I’m such a fan of caramelized onions that I think I would love anything put on top of onion marmalade. 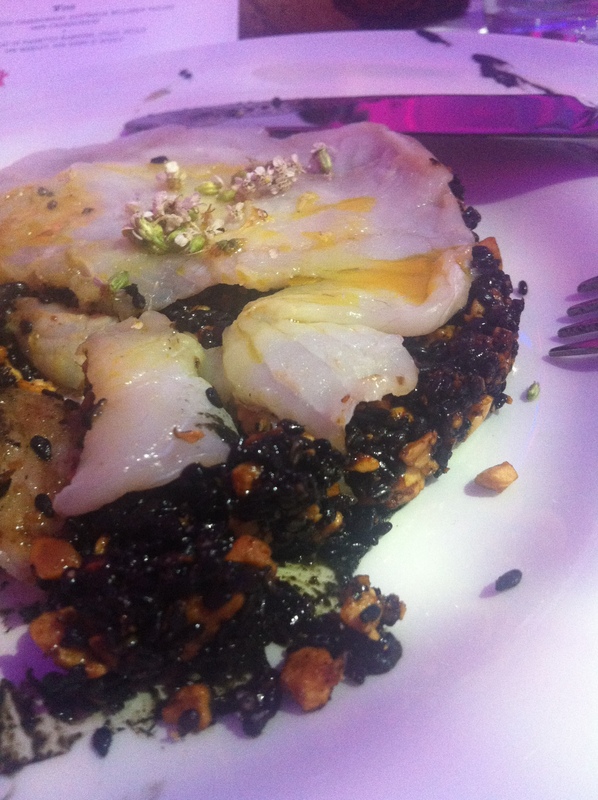 The second course was a disc of chopped toasted nuts and black sesame seeds bound together with a light syrup, topped with a thin slice of turbot and a curry oil. I loved the nut and sesame seed combo; it’s one I’ll remember and incorporate into my own repertoire in some way. 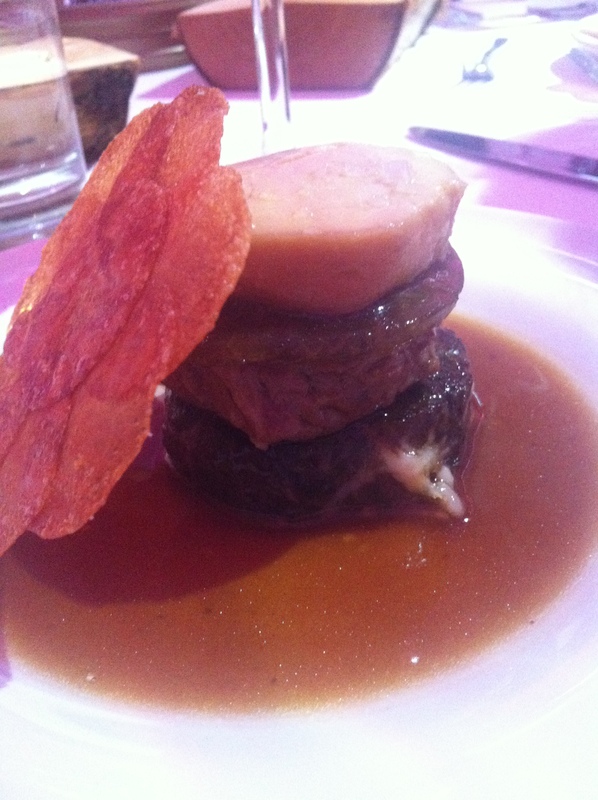 Our main course was a oxtail topped with a small piece of rib-eye, foie gras, and a truffle jelly. Served with a sauce made from port wine and sherry vinegar and maxim potatoes. The potatoes originating from Maxim’s in Paris are very thin slices arranged in a flower pattern, brushed with clarified butter and baked into a beautiful crisp disk. Someone at our table picked up the thin potato flower and joked about such a small serving of potatoes in Poznan. This region has to be the potato capital of Poland. They even have their own regional word for potato, pyra rather than ziemniaka. Pyra is also used to refer to people from Poznan. We were chatting with our waitress last week, and when we asked where she was from, her response was, “I’m a Pyra.” Potato jokes aside, this course was amazing. The sort of thing you’d make at home if you had a big talented kitchen team for backup. 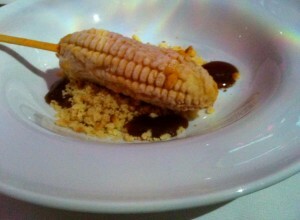 The dessert was described as banana parfait with crunchy macadamia, salty caramel sauce, corn bread crumble. The banana ice cream came out in the form of corn on the cob. This was especially creative because in the movie, an automated machine is feeding Chaplin corn on the cob, of course, it goes out of control at that point. One of our table mates said about the dessert, “it’s good that it’s not too sweet.” While I applaud the creativity of the dish, for me, it was a very Polish dessert, not at all sweet, and I want my desserts to be sweet — just a difference in taste. 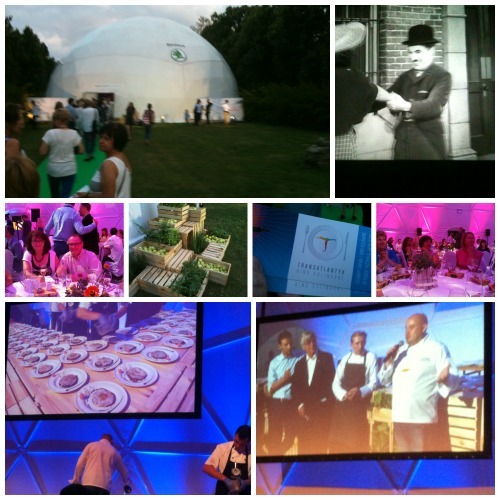 The evening ended with a standing ovation for the crew who prepared and served our meals. 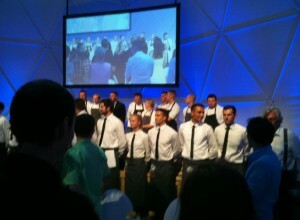 It was amazing to watch the wait staff as they served the courses. Picture this; we’re at tables of 10. Five waiters arrive with a plate in each hand, standing behind every other chair. The lead waiter nods and in unison they place their plate on the table and then step to the left. The leader waiter nods again, and the second plate is served. A final nod and the team circles the table and they file after the leader waiter and return to the kitchen. It was a beautiful performance. They sent us home with a goodie bag that included two copies of Food & Friends magazine and a jar of house made chutney from Bazar 1838. It was a great evening. If you have the chance to attend, by all means, do! 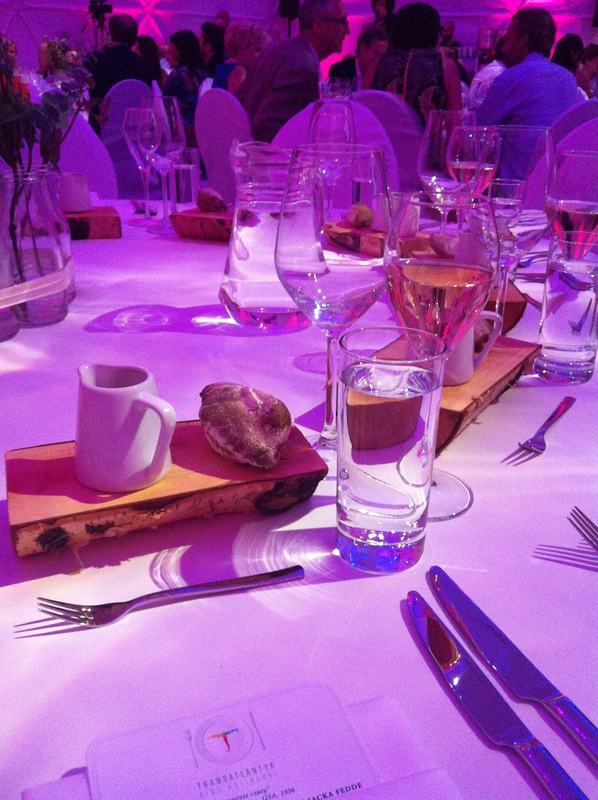 It was pricier than your average meal out in Poznan, but this was no average meal! I am blessed to have friends like Barbara who make sure I get to see what makes Poznan so special! ps – I should also add that Jan Kaczmarek stopped by every table during the evening, just to chat for a few minutes, see if everyone was enjoying the evening. I don’t think I’ve ever been that close to an Academy Award winner. That is one incredible night. Thanks for sharing these sweet memories with us Lois! My pleasure, Julie. You’d would have enjoyed it. I think it’s so cool that this successful composer for films, who lives in LA now, has brought this to back to his native Poland. What a fantastic evening! 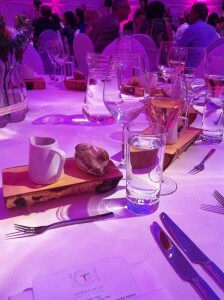 And what a huge amount of thought and work went into preparing the meal. Yes, it was quite and undertaking. 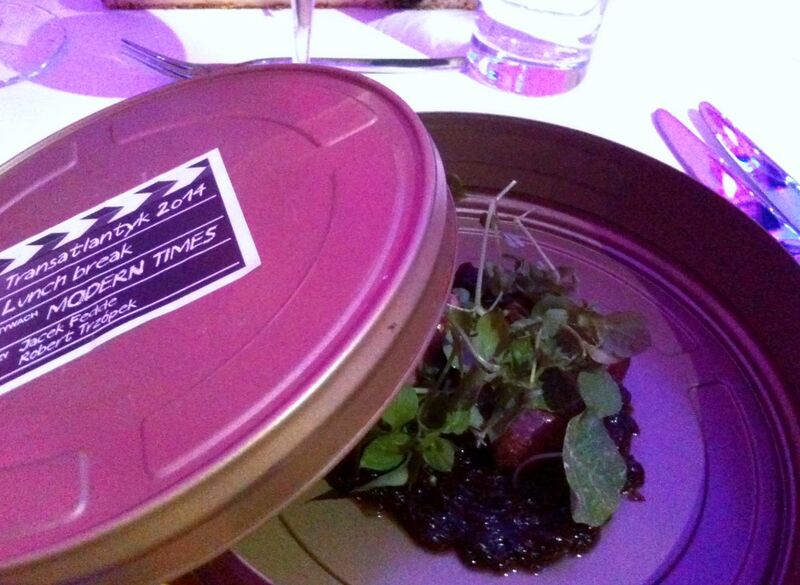 They’re doing several nights, all with different films and different menus. If you like the influence of Asian ingredients like you had with the turbot, I highly recommend checking out Jean Georges’ cookbooks or recipes. That’s where I worked in NYC for 2 1/2 years. Sometimes the recipes are a bit complex, but you can at least get some inspiration. It was a real happening, Joy! I know you would have enjoyed. I have friends who went last night, different film, different menu. I eager to hear about their experience.